Being near the Feast of the Epiphany, the question arose as to some of the customs which surround this great feast. Specifically, the question was asked about the history of the blessing of water at the time of Epiphany. Accordingly, I turned once again to Fr. Francis X. Weiser, SJ, and the Handbook of Christian Feasts and Customs. PROCLAMATION OF FEASTS - One of the special traditions connected with Epiphany was the publication on January 6 of the annual letter of the patriarch of Alexandria announcing the date of Easter for the current year (epistola festalis). The scholars of Alexandria were considered most competent to make the difficult computations and observations necessary to determine this date, and thus the whole East followed their findings, which were sent to all churches by the patriarch. In the sixth century, the fourth Council of Orleans (541) ordered the same procedure in the West. 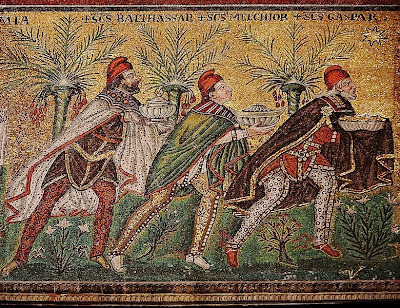 During the Middle Ages the dates of other movable feasts used to be added to the date of Easter and be solemnly read to the people on Epiphany Day. 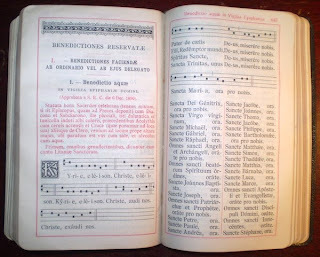 This ancient custom is still observed in some cathedrals as a traditional solemnity on January 6 at the end of pontifical Mass. Those who watch the Mass of the Epiphany celebrated this Wednesday, January 6th by the Holy Father in St. Peter's Basilica will hear this proclamation chanted. Therein the dates will be announced for the beginning of Lent (Ash Wednesday), Easter Sunday, the Ascension, Pentecost, Corpus Christi and the beginning of Advent. Another custom associated with the Feast of the Epiphany is the blessing of homes. UPDATE: A point neglected in the original printing of this piece, which some of our readers have graciously pointed out, is that while Weiser notes this tradition as "GMB" and related to the name of the three magi, in many places the initials would actually be "CMB", which could come in reference to the names of the Magi, or it could mean "Christus mansionem benedicat" which means "Christ bless this house." Perhaps it comes in reference to both or perhaps this represents local variations on this custom.